Anthony Michael Bourdain, Artisan, ( June 25, 1956 – June 8, 2018) was an American celebrity chef, author, travel documentarian, and television personality who starred in programs focusing on the exploration of international culture, cuisine, and the human condition. He was considered one of the most influential chefs in the world. 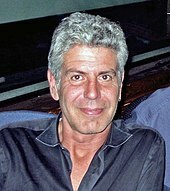 The Documentary Series, Parts Unknown, found Bourdain at the peak of his ability to convey a sense of place and community and connection over meals. The show was filmed and is set in places as diverse as Libya, Tokyo, the Punjab region, Jamaica, Cambodia, Los Angeles, Turkey, Ethiopia, Hong Kong, Nigeria, Far West Texas, Vietnam, London, the Bronx, and Armenia. Provincetown, Massachusetts. In this episode, the globe-trotting chef returns to his roots: his first job cooking in Provincetown, Massachusetts. It will be a hard, but important episode to watch at this moment, as it deals most closely with Bourdain’s history of addiction. Whether in Detroit or Colombia, New Jersey or Vietnam, Bourdain’s allegiances were clear; he gravitated to people dealt a bad hand by history, the victims of unjust political and economic structures. But he never let them just be victims. In the interior of the Democratic Republic of Congo, he finds a man who maintains an old library that has long since stopped receiving funding from the state. The librarian makes sure the grass is mowed, the floors swept, and the books kept in order even as they disintegrate around him. Bourdain is clearly moved by his seemingly Sisyphean work. The lush cinematography lingers on the fraying bindings, the decaying machinery, and the advancing damp, but it also takes in the palpable neatness of the man’s desk and the grace of his quiet resolve. Other examples of Composer Artisans include: Larry David, Bill Cunningham, Daniel Day-Lewis and Steven Spielberg, Carole King, Marvin Hamlisch, Nora Ephron, Dr. Seuss, Meryl Streep, Cher, and Bob Dylan. Other Performer Artisans include: Yogi Berra, Robin Williams, Mickey Rooney, Sid Caesar, Steve Martin, Brittney Griner, Janis Joplin, Gene Krupa, Louis Armstrong, Alex Karras, Kim Jong Un, Phyllis Diller, Jim Cramer, Magic Johnson, Josephine Baker, Whitney Houston, Marilyn Monroe, Michael Jackson and Elvis Presley.